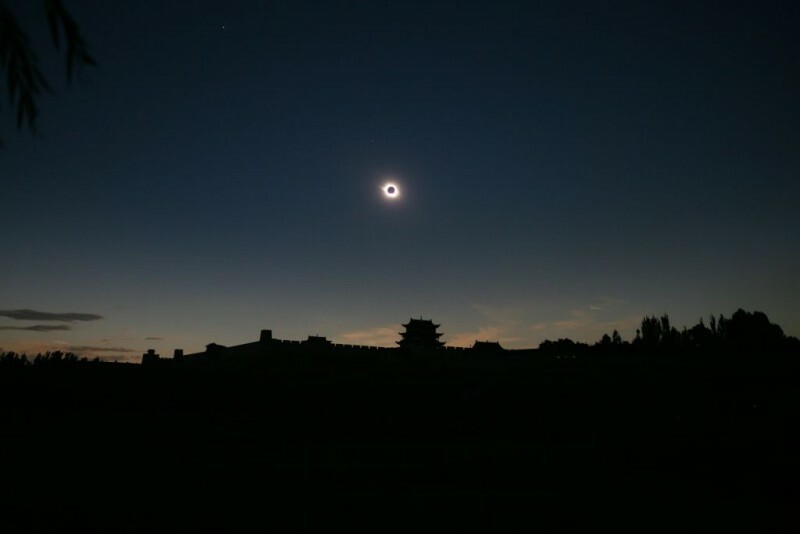 From the NASA Web site — a photo of a solar eclipse over the Great Wall of China. Here's another page that's perfect for a green tea break: ArtsOnEarth has dozens of photos from the Chinese Lantern Festival held at Toronto's Ontario Place. The festival is scheduled to run through October 12. 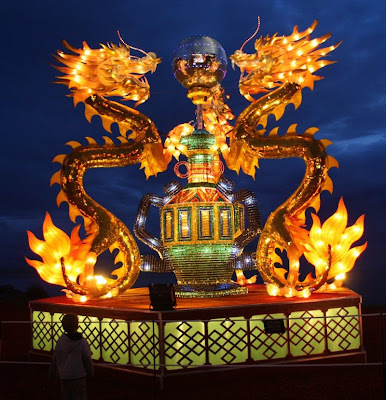 A "twin dragon" lantern display. Beat Takeshi saves the Earth as a 300-foot monster! Just like Tokyo on the verge of being destroyed by Ghidorah, Japanese cinema's kaiju (giant monster) genre was on the verge of dying out. Rushing to the rescue is director Minoru Kawasaki, who this summer released the decidedly-tongue-in-cheek Monster X Strikes Back—Attack the G8 Summit! 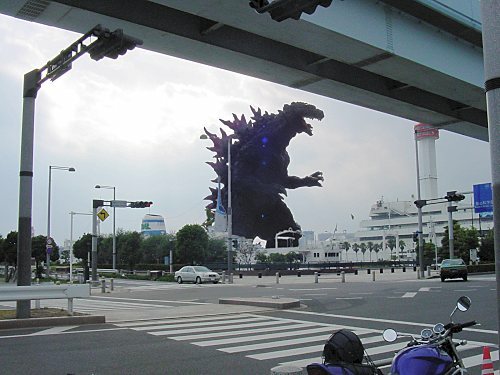 The film revives the kaiju Guilala, who first appeared in 1967. Lending a hand — several, actually (see photo below) — is famed director Kitano "Beat" Takeshi, who provides the voice and face of "good" monster Takemajin. Why Beat Takeshi? Director Kawasaki says Takeshi had previously donned monster suits in various TV appearances and "was the only one who could save this dying genre" [source (Japanese)]. 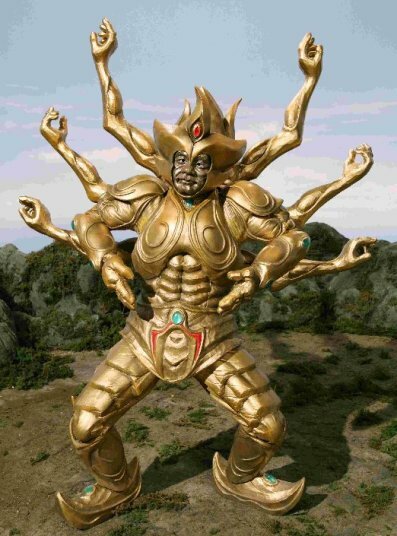 Takemajin — who has already started appearing at conventions — also borrows part of Takeshi's name and the meme of the "village guardian deity idol who grows to gigantic size to wipe out the bad guys" from the Daimajin trilogy of the '60s. See high-resolution stills of the new Guilala flick here. See a trailer here. See a clip from the old Guilala movie here. Ever seen a goblin shark in action? Well, here's your chance — a video of one of the elusive creatures filmed by a Japanese diver. Note how the shark's entire jaw pops outward to seize its prey. Remind you of anything? The shark shoots out its jaw the instant the diver moves his arm away, simulating fleeing prey. The shark holds on tightly, but the diver reported feeling no pain. Then, after the diver removed the jaw from his arm, the shark became calm again, as if nothing had happened. This dive team had spent several months looking for the goblin shark. After this brief encounter, it disappeared back into the darkness of the deep. Located off the Horn of Africa, the Socotra Islands are home to some truly amazing flora and fauna, including stunning species of trees. The Socotra desert rose, a.k.a. bottle tree (Adenium obesum). In the rural Tsukigata district of Niigata City, an entrepreneurial farmer came up with a clever name for the watermelons he grows — Godzilla eggs. Has Toho Studios seen this? Maybe all that fuss was just because Mommy was looking for her eggs. Remember the song "Midnight at the Oasis"? Well, here are some honest-to-goodness oases that perfectly match the visual images that the song had always created in my mind — cool, mellow places in the middle of a hot desert. Peru's — yes, Peru's — Huacachina Oasis. Is your green tea brewed? Good, because here are a couple of amazing panoramic shots from Beijing that are perfect for gazing upon while sipping a nice cup of green tea: a diver's view of the Water Cube and the Beijing Olympics Stadium (a.k.a. the Bird's Nest) about 30 minutes before the Men's 100 Meter Final. Click on this image to view the full-sized version. Researchers at Australia's Monash University have found that carbohydrates and and sugars promote weight gain not only by being converted into fat but also by damaging the brain cells that suppress appetite. This happens because carbs and sugars create large amounts of free radicals, which attack neurons in the brain known as POMC neurons. When we eat and our stomach fills up, these neurons — when functioning normally — "turn off" our hunger by telling the brain, "OK, you can stop eating now. We're full!" But when these neurons degenerate prematurely over time due to the free radicals in carb- and sugar-rich diets, these cells lose their ability to suppress appetite. A person with weakened POMC neurons will still feel hungry even after eating his fill and consequently pack on the pounds. But green tea, remember, is positively rich in antioxidants, which zap free radicals — including (presumably) the ones that attack POMC cells. So, by keeping our POMC cells healthy, green tea can fend of obesity. There will be a test on this tomorrow. Faffing is good. It is an important part of life. Faffing is when we disconnect from the matrix and idle for a while, like a car. Our body and spirit know deep down that human beings were not made for constant toil so subconsciously creates space through the mechanism of faffing. 1. Every morning and evening, hammer out the kinks. Using your fists, gently thump the outside of your body, starting with your legs and arms, working from top to bottom. Then move inward to your torso and thump from bottom to top. "Pummeling your muscles and bones will help strengthen the body, stimulate blood circulation, and relax nerve endings," says Walsemann. When done in the morning, this self-massage technique will waken and prepare your body -- and mind -- for the day ahead. When done before bed, it calms down the mind and beats out the stress and tension of the day. One warning: If you're taking any kind of blood thinner, such as Coumadin (warfarin), avoid this one; you could wind up with bruising. By the way, Grasshopper, brewing and drinking green tea is another great excuse for a faffling session. And green tea has the added benefit of also being good for your body, too. "Ah, I can smell the green tea brewing." Shibuya Station is one of Japan's busiest rail stations. On an average day, the station is used by over 2 million people — but never any monkeys. That statistic changed on Wednesday, however, when a lone macaque monkey scurried into the station and took up residence atop a sign for couple of hours. After the monkey refused to show a ticket or commuter pass, station officials called the police, who despite showing up en mass and with nets and despite giving furious chase, were unable to catch the creature, who scurried past enthralled commuters out of the station and into the crowded city streets. Most likely the fugitive escaped to Harajuku, where an ordinary monkey would never stand out. Yahoo! Japan has a video clip [Windows Media Player format] of the chase. Right after the Great Escape, people near the station began reporting fruits and vegetables going missing from their backyard gardens. "I knew I should have taken that left turn at Albuquerque." John Fiorillo has an incredibly extensive online archive of Japanese prints called — what else? — Viewing Japanese Prints. 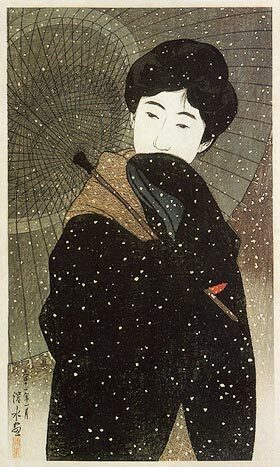 An example of the shin-hanga ("modern print") style. "The Ninja Convention" and "The Late Riser and the Dictator"
Risking life and limb, a blog reader took a photo at the 5th Annual Ninja Convention. Next up: Are you a late riser stuck in an early riser's world? If you think you are, you will definitely want to read these "5 Reasons Why Sleeping In Every Day Will Boost your Productivity." The linked-to article features a hilarious video short — which I am embedding below — which could be titled, "The Late Riser and the Dictator." It's in Korean (I think) with German subtitles (I think), but no translation is necessary. Follow these two basic tips, and you'll be brewing green tea like a tea master. A traditional yuzamashi is an excellent way to cool boiled water before brewing tea, but you can also use an alternative. Let's say you're a baseball fan, and your team moves to a new stadium, leaving the old one abandoned. That's the bad news. The good news is that you could actually build a home — a real, honest-to-goodness house — smack dab in the middle of the old stadium and live there. Wouldn't that be just too cool? Yes, it would be too cool, which is why you can't do it. Rumors spread on the Internet, however, that a lucky handful of people were doing just that in Osaka Stadium in Japan. Probably because of pictures like the one below. 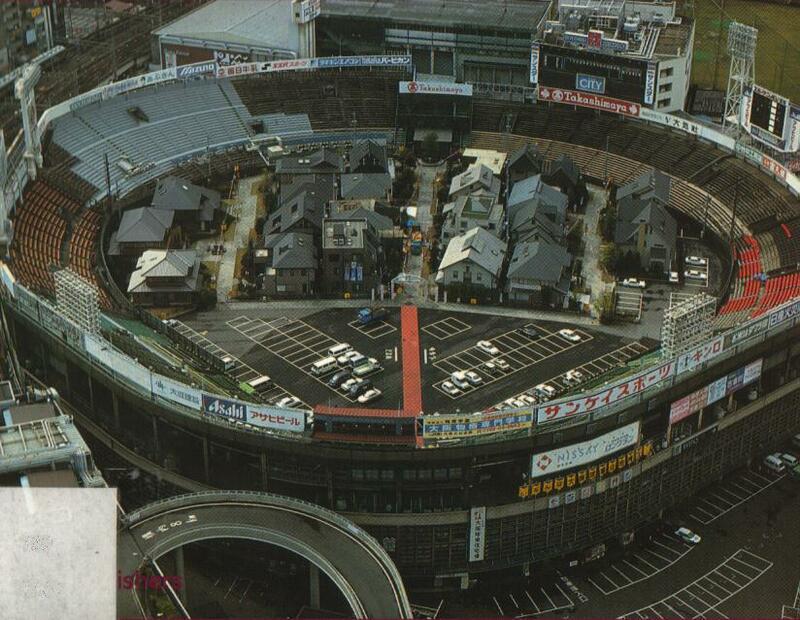 But it turns out that although those are honest-to-goodness homes smack dab in the middle of shut-down Osaka Stadium, they're only model homes put there by a homebuilder to show off their wares. So, you can walk through those homes, but you can't live there. Because that would be just too cool. "I even tried Febreze, but I still can't get that hotdog smell out." Yi Feng is a tea grower in the Chinese farming village of Fan Sheng. Two-thirds of China's 1.3 billion people live in farming villages like this, and like most of them, Yi Feng is far too busy with everyday chores to pay attention to the Olympic events going on in Beijing, to the north. "The Olympic Games?" she asked, apparently perplexed that anyone would bring up such a subject at harvest time on these prime tea-growing slopes in coastal Zhejiang province. "With all I have to do these days, how could I pay attention to the Olympic Games?" Carrying bags of freshly picked tea leaves down a narrow lane in Fan Shen. 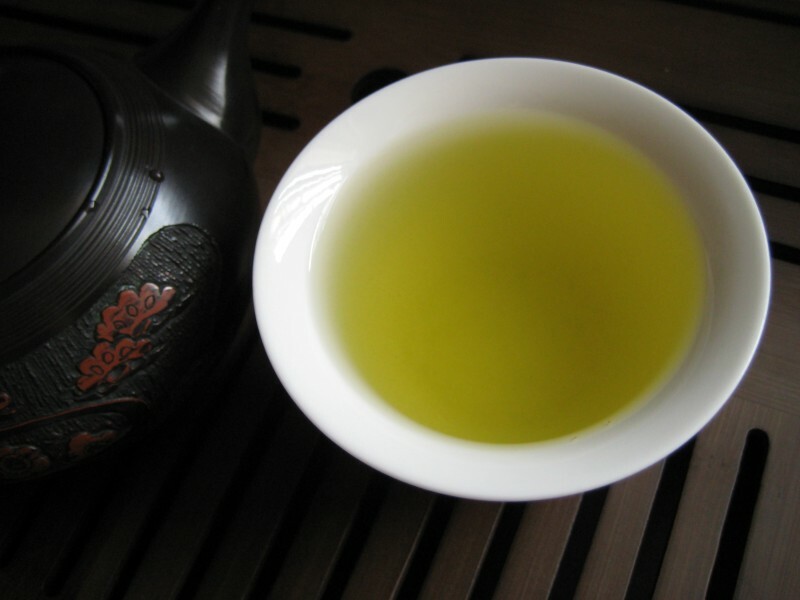 In a study done at the University of Mississippi Medical Center, the green tea catechin epigallocatechin gallate (EGCG) significantly inhibited breast tumor growth in female mice. The Medical Center at Ole Miss, where the research was conducted. Like a giant inkjet printer, the fountain in the Canal City shopping arcade in Fukuoka, Kyushu, spells out words and draws pictures with falling drops of water. It seemed like it couldn’t miss: the king of Hong Kong martial arts action flicks making his American film debut with the director of “Enter the Dragon” at the helm. But oh, how this movie did disappoint. Chan had already shown the world some incredible stunts and fight scenes in movies like "The Drunken Master" [video link], but the creators of "The Big Brawl" decided to saddle Chan’s character with that most hated of kung fu movie clichés, the Reformed Street Fighter Who Promised His Dad/Uncle/Grandfather Not to Fight Any More. Top off this action-free first half with a goofy, carnival-like second half complete with professional wrestlers, pinstriped Mafioso, and roller skating, and you’ve got a wince-inducing waste of talent. Chan took one more shot with a cameo in "Cannonball Run," then went back to Hong Kong to make a string of big-budget action epics, after which someone in Hollywood had the bright idea of compensating for his limited English abilities by pairing him [video link] with indefatigable motormouth Chris Tucker. To break into Hollywood after her riveting performance in the Australian thriller "Dead Calm" [video link], Nicole Kidman snagged a costarring role in a racing movie featuring Tom Cruise. Somehow, her movie career recovered rather quickly, although the recovery of her personal life from the fateful run-in with Tom Cruise took considerably longer. Let’s see, when an actor has established a rock-solid reputation as a high-energy thespian capable of exhibiting powerful emotions and ferocious intensity, what would be the best role to showcase those talents in Hollywood? The answer is obvious: playing a suit-wearing executive who does a lot of pensive posing while watching cars going round and round a racetrack. Two years later, however, Mifune would more than make up for "Grand Prix" by costarring with Lee Marvin in the excellent "Hell in the Pacific" [video link]. After he co-wrote and starred in the horror-comedy sleeper hit "Shaun of the Dead" and the not-as-funny (but still pretty good) "Hot Fuzz," Simon Pegg thought he was ready for Hollywood. Perhaps he was, but he had the misfortune of picking a film directed by David Schwimmer. David Schwimmer? What were you thinking, Simon? But Simon will be playing Scotty in the upcoming "Star Trek" film, so all is forgiven. "Amelie" is the film that started the whole "kidnap a lawn gnome and take it on a world tour" prank. Despite that, it’s a wonderful film, due in large part to the subdued but irresistible charm of French actress Audrey Tautou. However, someone clearly determined to sabotage her big break into Hollywood persuaded her to audition for the role of the annoying, charmless police cryptographer in "The Da Vinci Code." Ms Tautou then returned to her home country to make films, such as "Priceless," in which she actually portrays appealing human beings. Better luck next time, Audrey. [University of Rochester psychologist Edward] Deci tracked a bunch of college students who were solving puzzles for fun. He divided them into two groups. One group was allowed to keep solving puzzles as before. People in the other were offered a small financial reward for each puzzle they solved. The psychologist later evaluated the volunteers: He found that people given a financial incentive were now less interested in solving puzzles on their own time. Although these people had earlier been just as eager as those in the other group, offering an external incentive seemed to kill their internal drive. The lesson may be that if you really enjoy a hobby, then perhaps you should keep it at that. After all, one of the purposes of a hobby or some other pasttime passion is to help us escape from the pressures of the real world. "If I pay my kids to do their homework, I am saying, 'You will get this if you do your homework,' but I am also saying, 'Homework is not likely to have intrinsic rewards,'" [Princeton University economist Ronald] Benabou said. To the extent that a child is doing homework because he or she enjoys the challenge, or wants to demonstrate intelligence and diligence, the homework has meaning beyond the task itself, and Benabou predicts that offering a reward will backfire. This reminds me of the episode of "This American Life" in which a mother sought to end the chronic quibbling between her young daughters by paying the older girl to play nicely with the younger one. Now that just can't be good. In Japan, the manager of a fancy hotel paid over 900 dollars for a pound and a half of premium grapes. And these aren't just any old grapes, mind you. These are Ruby Romans, a variety that the Ishikawa Prefecture Agricultural Research Center spent 11 years developing as a way to stimulate local agriculture and bolster Ishikawa's image in Japan as a producer of high-quality fruits. Hey, if they can get people to buy their grapes at 600 dollars a pound, I'd say they were successful. Ruby Roman grapes are twice the size of Japan's kyoho variety, making them not only Japan's most expensive grape but also its largest. "I know it's a lot of money, but these a REALLY good grapes." At $26 a grape, they'd better be good. Their verdict: thumbs up for a very mellow tea. I'm glad you enjoyed our tea, Joe and Brandice. "Mismatches" between people who view time differently are common in marriages, Zimbardo says. When future-oriented spouses clash with mates who live mostly for fun in the present, "you hear 'He's irresponsible' and 'She's a slave-driver,' " he says. Trouble can erupt over how to spend money, free time or vacations and how to raise kids. These parents, most of whom are in their 30s and early 40s, want quality family time now. "They're not as driven as their parents were career-wise, and there's more emphasis on family togetherness. They want their kids to have a good future, but there's less insanity about it," Chung says. On the other hand, if you're a worrier — or even just a "ruminator" — you can console yourself knowing that overthinking may protect against dementia. Mike Cash, an American truck driver working in Japan, has a photoblog of the sights he sees on the road. 12. Finally trimmed the hedges in our front yard. – I always put this off because I am tired after mowing the lawn. This time, however, I did it on a totally separate evening. It only took me 30 minutes. 13. Cleaned out the garage and sold 2 old dehumidifiers on eBay. – We setup a 5-day eBay auction and got $65 for each one of them! 14. Took 2 evening strolls around a local park. – We hadn’t been to this park in years… there’s only 1 reason why. Of course, you can also cheat by recording all the programs you want to see during the week, then watching them on the weekend. You also get to skip through the commercials, and even with "old school" VCR technology, the recording isn't that hard to do once you get into the habit. Or is that cheating, Marc and Angel? Japanese artist-physicist Sachiko Kodama creates works of art that utilize amazing scientific phenomena. It's not animation or any other kind of photographic trick — it's for real. In one work, titled "Protrude Flow," Ms Kodama uses electromagnets to make ordinary dirty black oil — a ferromagnetic liquid, or ferrofluid — seemingly come alive. 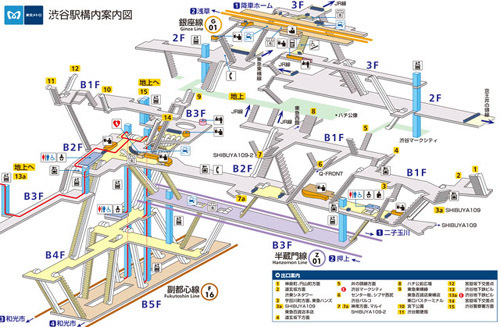 Here are some three-dimensional maps of Japanese subway stations. These show how truly intricate some of these underground stations are. So if you ever arrange to meet someone at one of these stations, be very specific about exactly where you're going to meet. 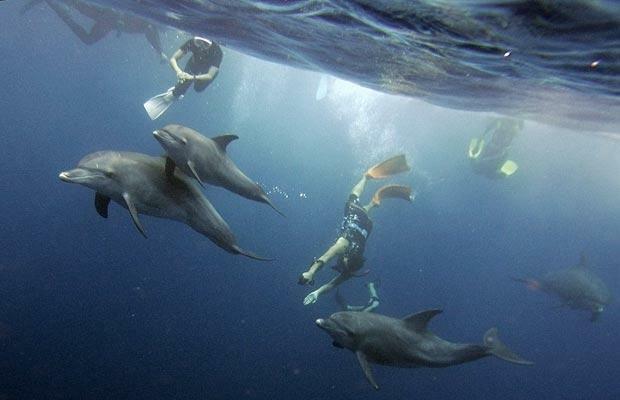 One of the biggest attraction of Mikurajima — a tiny, unspoiled island hundreds of miles south of Tokyo — are the surroundings waters, which team with dolphins, some of whom have been known to pose for pictures. "Excuse me, but do any of you know a guy named Flipper?" Like Yakushima, Mikurajima is a mountainous volcanic island with a coast that is steep, rocky and inaccessible at many points. Last year I blogged about the new Asian health trend of doctor fish — species of fish that nibble away at dead skin on a person's body. Tracy Roberts, 33, of Rockville, Md., heard about [fish pedicures] on a local radio show. She said it was "the best pedicure I ever had" and has spread the word to friends and co-workers. "I'd been an athlete all my life, so I've always had calluses on my feet. This was the first time somebody got rid of my calluses completely," she said. But if you're really brave, you'll go for the full-body treatment. Eat up, boys. There's more where that came from. Looking back, I see that my chaos-filled pickup of the crew at the airport portended the turbulent adventures to come. The plane carrying Chris, the cameraman, and Manuel, the sound engineer, touched down at Kumamoto Airport on time. The duo were already outside waiting next to their mountain of equipment when I pulled up to the curb at Arrivals with our intrepid director, Ilka, who had arrived ahead of the others to scout the southern Kyushu locations where we’d be filming. But Chris and Manuel, when taking inventory of the baggage disgorged onto the luggage carousel, had found that a highly important item had come up missing: the case of high-definition videocassettes. 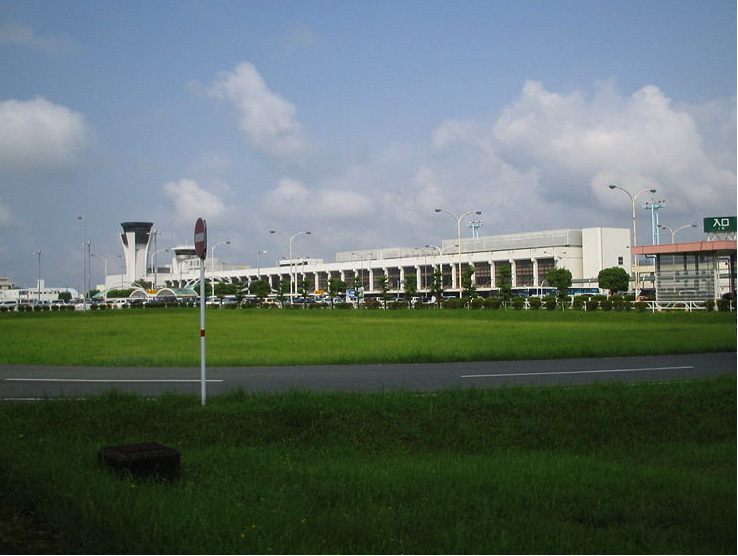 A call to the airline revealed that the wayward case, unlike its owners, hadn’t made the connecting flight from Tokyo to Kumamoto. And no tapes meant no filming. We were in a big fix. Yes, but … call a TV station, get a technical person on the line, and have him or her track down a very specific type of professional-grade high-definition videocassettete — at 4:00 in the afternoon on a Friday? In a small town like Kumamoto? It might actually be easier to find Aladdin’s lamp, summon the genie, and have him find the tapes for us. Not having a magic lamp, I instead whipped out my trusty Softbank flip phone and punched in the airline’s “where the hell’s my luggage?” number. Navigating through the phone tree I reached a live human being who had good news and bad news. The good news: the missing case had been found and sent on its way. The bad news: instead of overnighting the case, the airline had used a standard courier service, which from Tokyo would take three whole days. Three days that we just didn’t have. Filming was slated to begin the next morning, and our über-tight schedule would not permit even one day of delay. This made it absolutely imperative to find those tapes somewhere in Kumamoto City in the next couple of hours. I called both of the greater Kumamoto City area’s local television stations. My call to the first was answered by a lone receptionist who told me that all the engineers, technicians, and anyone else who would know about videocassettes were either out of the office or had already gone home for the weekend. So my call to the second TV station was going to be a real Hail Mary pass. Luckily, the receptionist there transferred me to a late-working broadcast engineer who sympathized with our predicament. Before taking this studio job, he said, he had worked in the field for twenty years and was more than familiar with how logistical glitches like this could bring production to a grinding halt. In America, “I’ll call you” is sometimes shorthand for “Don’t ever call me again.” But this was Japan. And the man did sound sympathetic. Optimism was my only option. Especially since there were no magic lamps in sight. Outside, Ilka and Manuel were filling every nook and cranny of the van with those pieces of luggage that the airline had managed to get to Kumamoto. Meanwhile, Chris had wandered inside and taken up position next to me as I was frantically phoning. Chris wore a very British look of quiet concern. Finally, after what seemed like an eternity but was probably closer to ten minutes, my phone beeped to life. The broadcast engineer’s voice buzzed through the earpiece. I thanked our saint/genie and hung up. One hour? Let’s see . . . We were only about 50 or 55 minutes away, assuming a brisk tailwind. 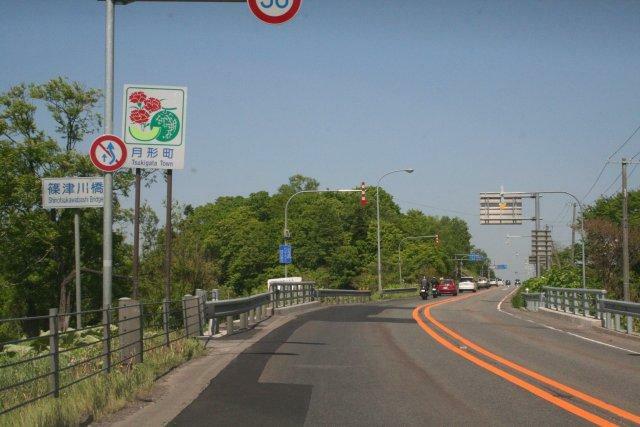 I hadn’t driven into Kumamoto City in about 10 years and I didn’t have a map of the city, which we weren’t scheduled to visit until much later in our itinerary. But other than that, thing were looking up. Cellphone in one hand, envelop with directions hastily scribbled on it in the other, and holding the steering wheel with both sweaty forearms, I drove our packed-to-the-ceiling van toward downtown Kumamoto City while pleading on the phone with the electronics store to stay open just a little bit longer until we got there, which really really, honestly this time, would be any minute now. Finally we were in the home stretch, careening down Kumamoto’s “Streetcar Boulevard” (densha doori), only a few blocks away from the electronics store — at least according to my scribbled map. 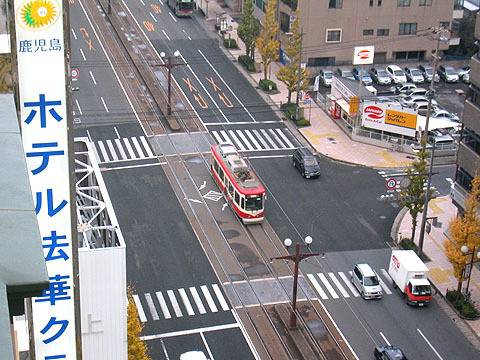 Kumamoto City's Streetcar Boulevard (Densha Doori). A nervous minute later, we spotted — and passed — the small electronics store crammed in between two massive, shiny office buildings on the opposite side of the street. I made an illegal U-turn across the streetcar tracks and came to jolting stop in the parking lot. Tapes securely aboard, we rolled out of the parking lot and merged into the Friday evening traffic. The mood in the van was downright cheerful. A soft, cool evening breeze wafted in threw the open windows. Everyone was all smiles. In the back seat, a happy Ilka chattered in German to Chris, who translated for me: “Congratulations on surviving your baptism by fire.” The crew and I had done some serious speed-team-building. But little did I suspect that this hectic day would turn out to be an only too typical one in our three-week shoot. Ignorance, however, truly is bliss, and as I piloted the van southbound, toward the hilly countryside of Hitoyoshi two hours away, I was blissfully proud of the day’s accomplishments. 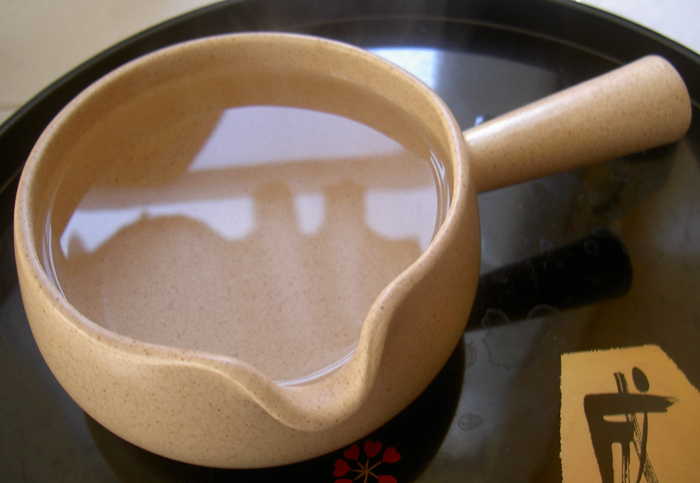 ThisNext — "This tea is absolutely delicious, and is the everyday tea of Japan. If you enjoy truly authentic green tea, then you will love Monk's Choice tea." 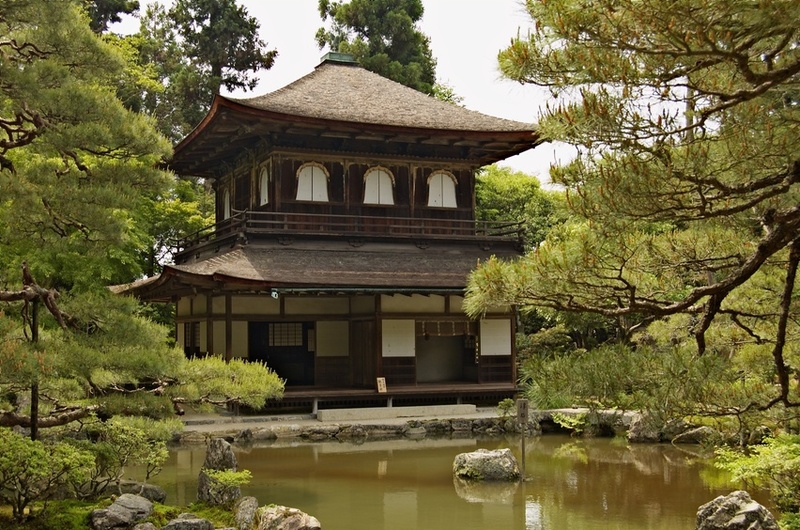 The Greater Green — "I spent three years in the Gunma region of Japan and during that time came to love green tea, the taste and the health and the art of it all. . . . It has been a struggle to find authentic green tea here in America. When I first drank Mellow Monk's teas it was like being transported back across the seas." Yelp — "I lived in Japan for a long time, and I can tell you this tea is the real deal - better even than a lot of the stuff sold in supermarkets in Japan." The Green Tea Review — "The scent from the brew is mellow and slightly earthy. Upon tasting, the slight tang presents itself to the palate. The tea at first tastes very clean and mellow with some earthiness, and is followed by a soft bite of tang characteristic of guricha." Cooking Little — "For some [reviewers] this tea was reminiscent of tea they drank on visits to Japan and never since." Multiple Infusions — "Dropped into a heated kyusu, 3.5 grams of leaf had a strong and complex–nearly holographic–marine aroma, all the smells of the ocean at once. After a 60 second steep at 174°F, the tide receded to reveal a mellower tea than the seaside odor suggested. Not quite as delicate as gyokuro, and not bold like sencha, this tamaryokucha takes up a nice position in the middle, with a steamy, clean earthiness and mildly vegetal sweetness . . . ."
Thanks, everyone, for taking the time to review our humble tea. Top Leaf Green Tea, as brewed by the folks at Multiple Infusions. I finally posted photos of my recent tea-buying trip to Kyushu, Japan, which was documented by a European film crew for the educational TV series "GEO 360." I've been writing about these adventures in the "Stringing Tea" series of blog postings. A picturesque shot of the crew taking a picturesque shot. Oh, how I would love to get rid of my lawn. I don't mean dump weed killer on it, but rather tear it out and replace it with plants that need far less maintenance. My wife claims this is just a conspiracy by which I aim to get out of weekend lawn-mowing duty, but that's not true! It's not for me; it's for the environment, see? In fact, such "lawn alternatives" have sprouted (get it?) into a veritable cottage industry. 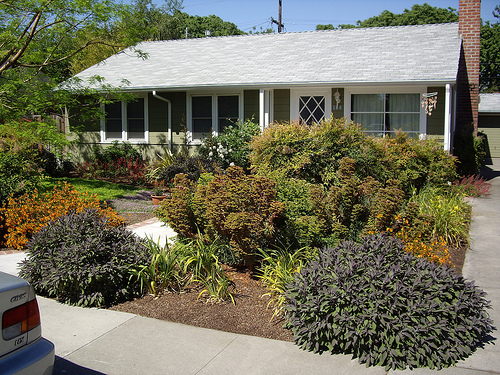 Flickr even has a new photo tag called "kill your lawn" for photos of lawn alternatives. Another American is liberated from his lawnmower. Just south of the small Okinawan island of Yonaguni is a massive undersea rock formation commonly known as the Yonaguni monument but which some call "Japan's Mysterious Pyramids." The rocks are evidence of an ancient advanced civilization that was destroyed in an earthquake that plunged it into the sea. The rocks are a completely natural formation that just happens to look as if carved by people. The rocks are natural formations modified by ancient Okinawans. In support of the third theory, the monument does resemble natural rock formations on the island. 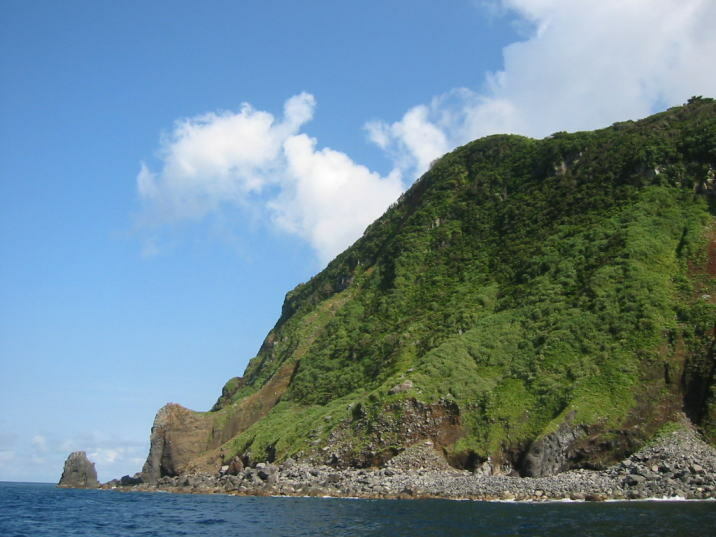 For instance, also in southern Japan can be found, on the island of Aoshima in Miyazaki Prefecture, a natural rock formation that the locals call "the demon's washboard" (oni no sentakuita). Natural or man-made — or both? Even demons have to wash their clothes occasionally.